Many double (and triple, for that matter) albums captured live shows; others were compilations that sometimes included previously unreleased material or hard-to-find b-sides. Double LPs of all-new material, on the other hand, were relatively rare, though any music fan worth his or her salt can reel off dozens of such titles, including ones by Bob Dylan, the Beatles, Who, Rolling Stones, Stevie Wonder and Allman Brothers, not to mention Pink Floyd, the Clash, Bruce Springsteen, Prince and Husker Du. Most, though not all, now fit onto one CD, and play no longer than many “albums” released as one disc in the ‘90s and ‘00s, when it seemed (at least to me) fairly common for new releases to clock in at over an hour; and, in the download/streaming age, time constraints just seem moot. But most CDs that run longer than 45 minutes contain – dare I say it? – songs that should have been left in the vault. In the days of limited space, only the best of the best were pressed onto vinyl. Yes, of course, exceptions abound. But they’re exceptions. Anyway, with fans and critics of a certain age being who and what they are, lists proliferate of the greatest double albums of all time. Here’s one; here’s another; and here’s yet another. If you Google the term, you’ll find dozens more. 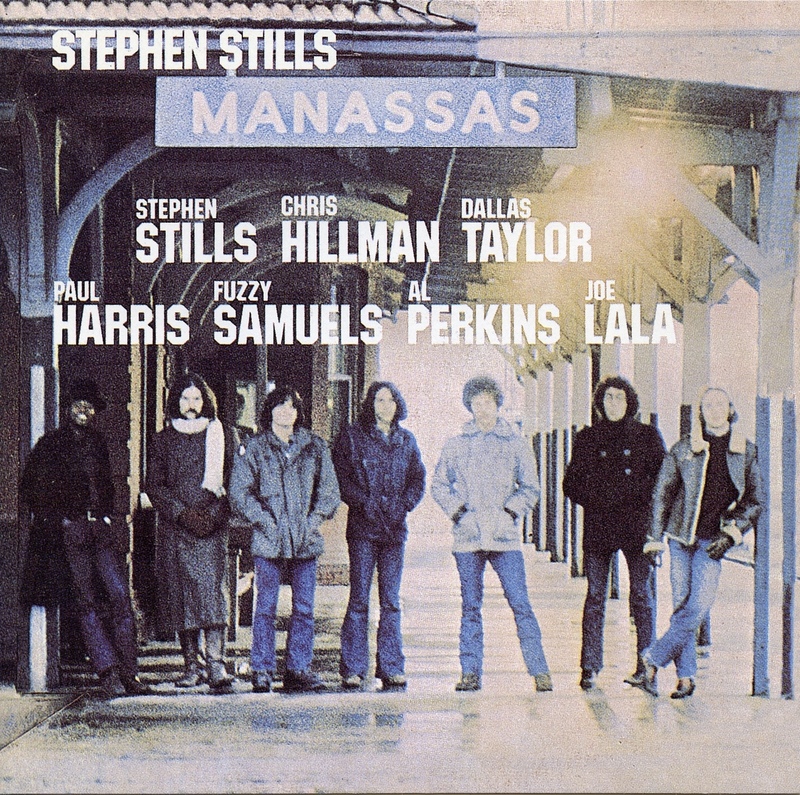 And yet, on just about every list I’ve seen, one stone-cold classic – “a sprawling masterpiece,” according to AllMusic – is usually overlooked: today’s essential pick, Stephen Stills’ Manassas. Stills, of course, first turned ears as the driving force behind Buffalo Springfield in the mid-‘60s; and again with Crosby, Stills & Nash and Young in 1969 and ’70. He released a great, self-titled solo debut in 1970; a near-great second solo set in ’71; and, in 1972, paired with former Byrd-Flying Burrito Brother Chris Hillman to found Manassas, a talented group that could play just about everything, including rock, folk-rock, country, bluegrass, Latin and the blues. Among the group’s personnel: steel guitar great Al Perkins and phenomenal fiddler Byron Berline, both of whom had played with Hillman in the Flying Burrito Brothers; keyboardist Paul Harris; Blues Image founder (and percussionist extraordinaire) Joe Lala; and CSNY alum Calvin “Fuzzy” Samuels and Dallas Taylor on bass and drums. Manassas, the album, is a mosaic of musical styles accented by top-notch playing and great songs. Split into four thematic sides (“The Raven,” “The Wilderness,” “Consider” and “Rock & Roll Is Here to Stay”), it alternately reflects and resonates with the soul; delves into the philosophical; and rocks with precise abandon. It’s an electric album. It’s an acoustic album. Some songs are imbued with hope, others heartbreak and longing. One highlight: “Both of Us (Bound to Lose),” which features a wondrous Hillman intro, a cool mesh of Cuban rhythms and country overtones, gorgeous guitar solos, and harmonies that can’t be beat. Another: “Fallen Eagle,” a song I sing to myself whenever I see too much of Donald Trump on TV. By virtue of my age, and the lack of non-CSN songs played on the radio, I didn’t discover the album (and its followup, Down the Road), until Feb. 12, 1984, when I picked them up at the Hatboro Music Shop. The double-LP set came with a cool fold-out poster that featured a photo montage on one side and the lyrics on the other; and, as I often did in those days, I read the lyrics along with the songs as they unfolded. I was blown away by it. I still am. And I’m forever mystified as to why it slipped – along with Stills’ other early ’70s solo sides – into semi-obscurity. It did well, chart-wise. After its release on April 12, 1972, it peaked at No. 4 on the Billboard charts, where it shared space in the Top 10 with David Crosby & Graham Nash’s self-titled debut and Neil Young’s Harvest. I bought this album while I was in the Army. Played it non stop. most of the people I knew had never heard of it,but were instant converts after they listened to a few tunes from the lp. This was Stills , Sgt Pepper or Pet Sounds classic!! I Was and still am so in love with this album. I played it over and over and over. I was in awe of all the talent in that band and was front and center when the played the old Fieldhouse at the University of Toledo to promote the album. I still have the Insta-matic pictures and tickets stub. I was blown away by Stephen and the way he played the banjo. It was such a magical night. Remember like it was yesterday. Couldn’t agree more about how good this album is and although I would have picked different examples thats the point . Theres so much here to make an opinion on . So much so this was the slowest burn in my record collection and over the course of fifteen years listening it eventually become one of my favorite records. ‘ sound track of your life ‘ stuff. Great commentary on this album. This music is so good and has such staying power (lifetime) that you can’t understand why everyone does not know about it. Their first live concert was in Amsterdam in March of 1972 and it is on YouTube and also recently became available as a bootleg recording on Amazon. It is my favorite live concert recording ever. They were amazing live. You should look for it.